Domestic problems are so adorable when they’re drawn like this! Whoops, I made the lettering a bit too small here. I made this one on real paper with my new ‘G’ inking nibs. 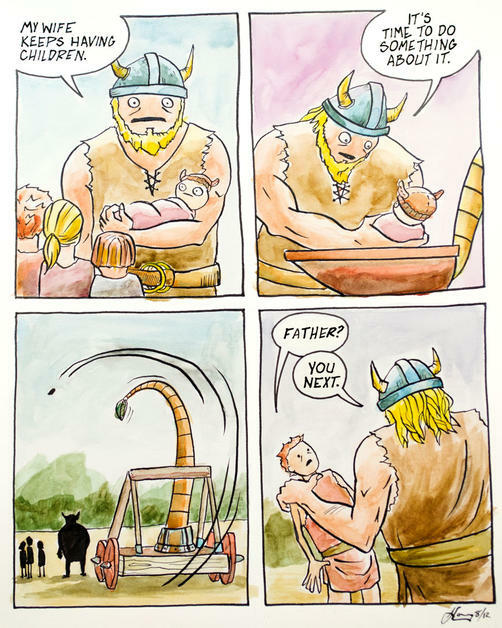 That viking birth control comic was made with them as well. I’m not completely used to them, but I’m enjoying using the nibs. Whoops, I just realized this comic should not have gone up yet. It was colored with real watercolor. I’m pretty sure THIS is the darkest comic I’ve ever made. The wife helped with it. So, you know. I won’t be alone in hell. If you’re interested in the way this comic was made, head on over here to see a process gif of the comic. Though not exactly our dialog, this actually happened today. You really feel like a grown-up while strolling the neighborhood with a baby strapped to your chest, a dog tied to your belt, and a 30-pack of brewskies. A man’s gotta do what a man’s gotta do. Only took about 4 months to do this. I forgot to ink a ton of stuff. And by tons, I mean probably 5 lines. Maybe later.